I was scribbling in my journal on my flight to India a couple of weeks ago that while I was expecting significant culture shock on my first trip to this intense nation, I was also thinking I’m becoming quasi-immune to it. This proved to be true when we landed in Trichi (which is what the cool kids call the city of Tiruchirappalli), and Michael, one of the other group leaders, pointed out to me that in the middle of the airport parking lot, grazing on a patch of grass were some of goats. By Indian standards, Trichi is not a huge city, but it’s a big enough city that to find goats hanging out in the airport parking lot was, once I thought about it, not within my sphere of normalcy. I don’t know if airport authorities brought the goats in as an alternative to buying a lawnmower, or if the goats were hoping to catch a flight to Mumbai later. 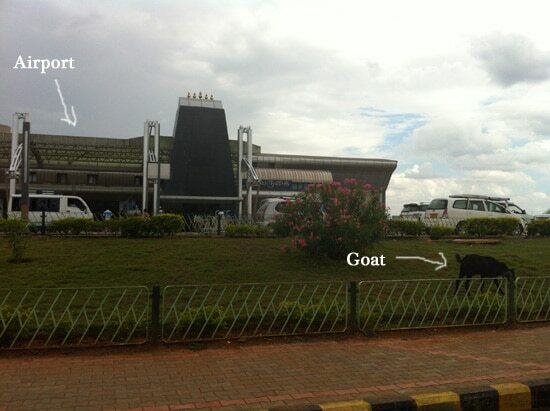 But what worried me more than the fact that there were goats munching grass at Tiruchirappalli International Airport was the fact that until Michael brought them to my attention, I hadn’t really noticed there were goats munching grass in the parking lot at Tiruchirappalli International Airport. I mean, I had seen the goats and all, but I was just sort of like, “Hey, goats, how’s it going?” as if this was totally normal. Which it apparently is in India. We got on the road to Tanjore. We drove for maybe 90 minutes in two minivans, past miles and miles of one-room shops, and roadside produce stands, and occasional gatherings of more goats. The streets were bustling with life, but in a mellow, low-bustle sort of way. “I was expecting India to be more chaotic,” I kept saying to myself. We Need Your Vote: Help Send Dave (and Sven Wondermoose) to India!